Adventures with Whole Brain Teaching: Smilies Anyone? This weekend after watching more webcasts with the wonderful Chris Biffle I created a new "rules" area of our classroom. I have it in the front of the room where we have our morning meetings. I think it is a great reminder to the students and me. 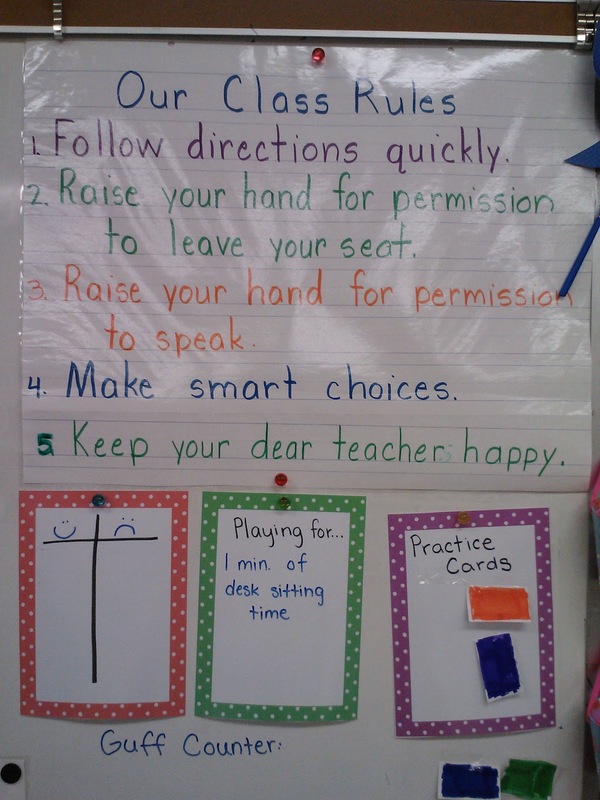 The chart is our class rules, which we recite many times throughout the day. Below that chart is our scoreboard. Sometimes we play smilies and frownies, sometimes we play it differently. After deciding how we will play we decide what we are playing for. There new favorite is "desk sitting time". We play silent ball while sitting on their desk the last couple minutes of the day. They go crazy for it! Next to that is our practice cards. They have been doing great with these and really reminding each other what to pay special attention too. Today I introduce the Guff Counter, which almost killed it for them. They didn't realize how much they talk after they say, "class, yes". One students even commented, "Mrs. Folsom, how do you teach with us talking so much." I loved this comment and we had a great discussion about it. Half way through the day the Guff counter really sunk in because they were losing and weren't going to have "desk sitting time", they quickly changed their behaviors. It was amazing, we accomplished so much. Below is a picture of our "rules" area. I still have so much to learn and cannot wait to learn it.